Water quality is an issue that’s raised more than a few concerns over the past few decades. Despite the continuing efforts of the EPA and state and local water agencies, chances are very good that the water you use every day is far from ‘pure’. Water in wells could be affected by contaminants in the ground water. Even if your water is supplied through a municipal water treatment facility, there are many contaminants that may slip through. Article describes how to approach home water filtration. Article describes various types of home water filter types. Point of use water filters are installed where the water is to be used and only filter the water at that one point. Point of use water filters include: faucet filters, countertop water filters, inline/undersink filters and shower filters. Some contaminants are easier to remove with a Whole House System. There’s nothing like a nice, steamy shower to get you clean and help you relax – unless you’re one of the millions of people who are stuck with hard or highly chlorinated water. In that case, a shower can leave you with itchy, dry skin, burning eyes and a general feeling that you’re just not clean. Hard water can leave deposits of minerals in your hair that leave it dull and flat, or irritate skin. 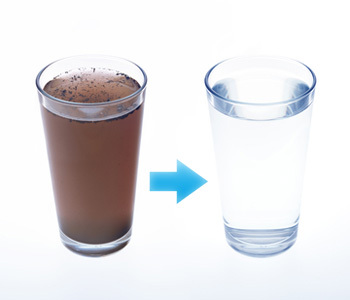 Reverse osmosis is arguably the most efficient way to remove the largest number of contaminants commonly found in water. It is also the least easily understood part of a water filtration system – but it’s really quite simple to understand. Quite simply put, reverse osmosis is the most efficient way to remove the largest number of contaminants commonly found in water, but it is also not trivial to do it right. Ultrafiltration (UF) is an important water purification technology used for production of high-purity water. UF is effective in the removal of colloids, proteins, bacteria, pyrogens (e.g. gram-negative bacterial endotoxins), and other organic molecules larger than 0.1 - 0.2 Micron size..